Green Kid Crafts is a green company that provides creative activities to do with kids through eco-friendly art boxes, birthday activities, and creativity kits. With Green Kid Crafts, both parents and kids can enjoy sustainable arts, crafts, and science activities that spark creativity, build confidence, and cultivate respect and love for the environment. Green Kid Crafts launched in 2010 and is the original arts, crafts, and science project subscription service for kids. Like so many of the best children’s products, Green Kid Crafts is a mother’s invention, created by a working mom who wanted to make the most out of the limited time she had to spend with her kids. Like many other parents, she wanted to spend that time connecting with her kids, not scrambling for ideas and shopping for supplies. “Create something I’m proud of.” – Projects allow kids to be creative, build confidence and enjoy a sense of accomplishment as they produce crafts they love, that are unique and special to them. “Move my body.” – Activities develop fine and/or gross motor skills and encourage active play. “Use my thinking brain.” – Completing GKC’s enriching crafts flexes kids’ sequencing, reasoning, and/or problem solving skills. “Discover the world around me.” – Each themed craft subscription box gives kids a wider view of their world, from either a nature-based, scientific, or cultural perspective. “Care for myself, others, and the planet.” – Discovery box themes and the kids craft kits inside also teach children to be considerate and respectful towards people and nature. You can now get Green Kid Crafts for 30% off! 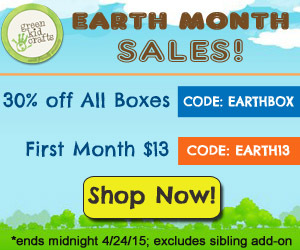 Act fast to snag 30% off on all of Green Kid Crafts’ past monthly Discovery Boxes! From Music Science and Dinosaurs, to Backyard Science and Mad Scientist, there really is a box for everyone! Use offer code EARTHLOVE at checkout to get 30% off all their single-purchase Discovery Boxes. New subscribers can additionally get their first box for only $13! 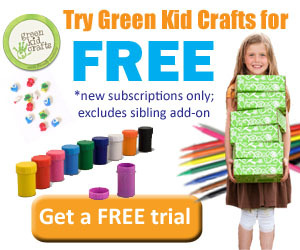 Use offer code EARTH13 at checkout to start your new Green Kid Crafts subscription for only $13. 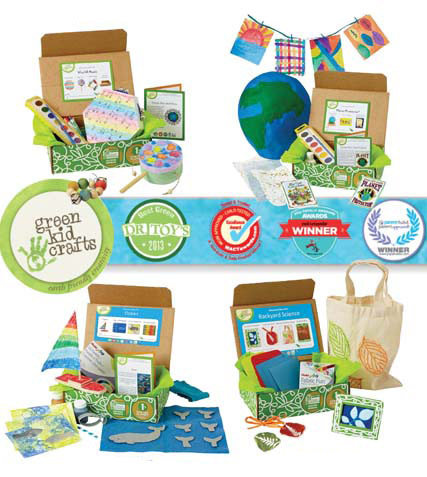 Green Kid Crafts’ award-winning Discovery Boxes pack a lot of fun and learning into convenient packages. Each box contains 4-6 Creativity and STEM Science Kits, extension activities, and free online extras. Projects are designed for ages 3-10. Offers expire April 24, 2015.